So, it's a tough job, but someone's got to do it. I just got back from a successful, but rather grueling meeting in Incline Village, NV. But if you're going to put in the OT it might as well be in a place as stunning visually as this. Also, a job well done is well rewarded with, in this case, a cocktail. After having actually won money playing roulette, I found myself exhausted, sore footed and in need of something different and fun to perk up. Not being in the least inspired by the wines by the glass, I turned to the cocktail section. Also not appealing since it was heavy with perennials like Apple-tinis, Cosmo-postors and Random Colada also-rans. We pondered for a second, and then it came to me. However, when I summoned the strength to order, the bartender's eyebrows shot up, his expression aghast, "What?! "[WFT was oh-so-implied]; he had interpreted my wan request as: "Pucker Manhattan." I cannot imagine what foul "Big Apple Nasty" concoction, he thought I wanted. I laughed and pointed, "No, Bookers Manhattan!" He smiled relieved and trotted off to whip up a seriously delightful drink. Or I guess at that altitude and Bookers' 124.6 proof, perhaps delightfully serious would be better said. In any case, Bookers http://en.wikipedia.org/wiki/Booker is not your father's Jim Beam. It's made in small batches, aged 6 -8 years and brings complex smoky aromas and flavors. The smoothness is astonishing given the whallop it packs. 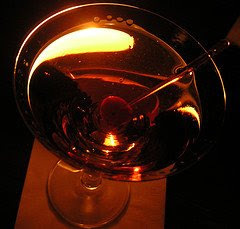 Its vanilla edge is greatly enhanced by a little sweet vermouth as called for in a Manhattan. 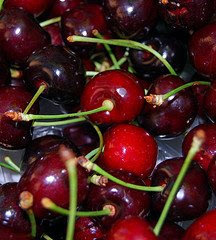 Being a gourmet ghetto girl, I much prefer the foofy Toschi cherries, but a retro maraschino hit the spot anyway. After one of these, we gambled a little more then called it a night. Yes, people this is a tonic! '06 Mourvedre, San Francisco Bay Love the varietal. This example had a cherry/blackberry deliciousness with a slight floral character and the normal spare, slightly bitter Mourvedre-ness that I love. All different---all delightful---all the notes I have are drunkenly sketched happy faces and a blissful sense of Yum! On my price sheet, these three wines had lopsided scribbles next to them that looked a little like pentagrams, but given the context, I'm thinking stars. 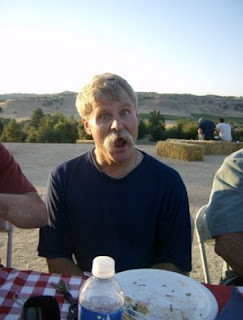 Ah, Petite Sirah! High alcohol fire of petite sirah masterfully done to bring out lots of fruit, floral, spices, mineral aromas and flavors. 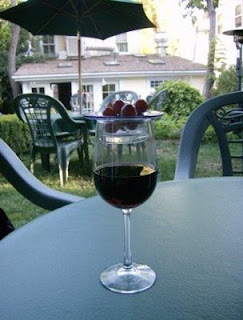 Despite the Cliff-iness of my notes, I hold the memory of kicking back in our beach chairs, dishing on the fashion victims and revelling in an afternoon of fun, wine and Tucker's Zinfandel Chip ice cream---three cones! Ice cream is low carb, right? I opened the more expensive Malbec first. My hopes were high yet were not met (until 1/2 hour later.) I was hoping for an elegant gaucho traipsing amongst the Pampas but I got something a little different. The Layer Cake Malbec vintage 2007 ($14.99 @ TJs) had a highly sulfuric nose at first (yuck.) Yet the darkly, elegant garnet color made me hope for more. Not even a run through the Vinturi made the aroma any better. So I let it go and breathe a little more while we enjoyed the other Malbec. Don Miguel Gascon Malbec vintage 2007 ($9.99) made a much better first impression. Hmmmmm, do I detect allspice on the nose? Why yes I do. Liza just happened to have a jar of allspice in her cupboard so we got to do that whole compare and contrast thing. Perfect match! Beautiful, jammy blackberry on the palate. Balanced acidity, velvety mouthfeel...Pretty darn good. IN Summary: Drink the Layer Cake with grilled meat (and let it breathe first.) Drink the Gascon for it's fruity character and velvety mouthfeel:) And please, let us know if you like the wine. Please post your opinion. Thx! But you'll just have to take my word for it as I uncharacteristically forgot my camera! Indigo http://www.indigorestaurant.com/ is described by the SF Chronicle as "one of the best deals around" and I have to agree, agree, agree. I signed up for one of their wine pairing dinners. I know purists sometimes object when the actual winemaker isn't there, but I have to say that Indigo did a masterful job of pairing these excellent and interesting wines. I had the good fortune to share a table of four with some lively non-BrixChick friends. 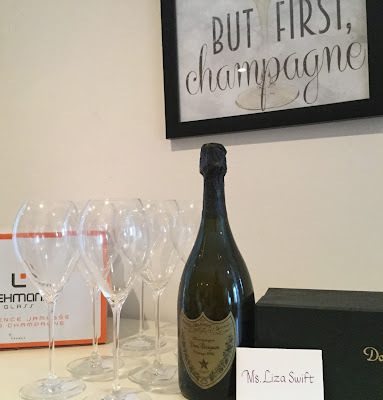 The first step was a palate cleansing cava, which I of course forgot to write down. It was a nice touch. 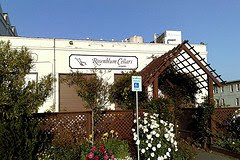 I had also made my reservation through Open Table http://www.opentable.com/ and asked for the window seat. Lo and behold another very nice touch...we got to sit in the window seat. Between the good table and the sparkler, I was predisposed to being happy! And the hits were only just starting. 2006 Peter Micheal Sauvignon Blanc, "L' Apres Midi", Sonoma Paired with Mixed green salad dressed with Ver Jus vinaigrette with toasted Almonds, Laure Chenel goat cheese and nectarines. WOW! Seriously one of the best pairings I've had outside the French Laundry! Wine was the color of lemon citrine and beautifully balanced so that it brought together all the flavors of the salad. Delicious! 2003 Kistler Chardonnay, Sonoma Valley plus bonus wine: Peter Michael Cuvee Indigene '03. Tasting the bonus wine against the featured wine allowed the pacing of the dinner to slow down at that same time as allow us a wonderful opportunity to taste these delightful wines against each other. The Peter Michael was initially tight. It was paler than the other wine. 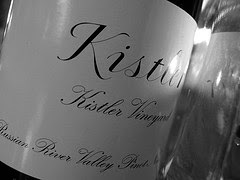 The Kistler burst out of the bottle with a rich golden color, rounded flavors of baked apples and dried pears and a balanced flavor with a tail of acidity. Initially, I found the Kistler to be the much better wine. These two were paired with Seared Day Boat Scallops over Caramelized Apple Risotto with a Hazelnut Brown butter Sauce. Once the Peter Michael opened up, it had rich flavors of dried pears and hints of pineapple. Both were delightful with the scallops. 2002 Kistler Pinot Noir, Russian River Valley was paired with a beautiful Wild mushroom tart with grilled red onions, truffle cream and a balsamic reduction. 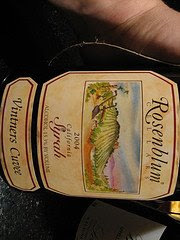 The wine was a lovely example of Russian River Pinot with the complexity that comes from the cooler climes as well as tart, bright bursts of Bing cherry. The only silence the whole evening at our table came when they delivered this feast for the eyes...Golden flaky pastry coaxed into a turnover shape with tufts of wild mushroom peeking out in a pool of lush balsamic sauce. Tasting both together, the slight acidity of the wine paired sublimely with the unifying truffle cream sauce. Texture, taste sight, sound---just imagine the aromas, this pairing clicked on every sense. Yum! 2004 Peter Michael "L'Esprit Des Pavots", Knights Valley (45% Cab Sauv, 33% Cab Franc, 17% Merlot, 5% petit verdot) . The wine had a lot more tannic grip, which we supposed was meant to pair with the grilled beef tenderloin and support the sides: sweet potato puree, roasted broccolini, green peppercorn sauce and truffle butter. After the exceptional Pinot, this blend had a tough time comparing. It felt a little thin, despite its dark ruby color. The meat was a little less rich than it needed to be to stand up to the tannins in the wine. However, the sweet potato puree with its dollop of melting truffle butter was the third chorus girl from the end who steals the show! Delicious! Shotglass of Black Muscat of unknown provenance. At this point in the meal, we were a bunch of rowdy girls and I was calling for Botrytis! Our gracious server brought us all bonus shots of a delicious black muscat. There was no room for coffee or tea. An appropriate finale, Molten Chocalte cake with vanilla whipped cream and bing cherries. The cake was dense and rich and packed with dark cocoa flavor. It unimaginably achieved a lightness. Perfect halves of perfect bing cherries formed the third part of the triangle in the bowl. Since we had a little left of the Kistler Pinot, we tried it with the bing cheries. The last perfect bite to a dinner that I will dream about! Luckily it's a good thing! Who knew this whole "noble rot" thing would produce such amazing wine? Not usually being one for the sweet wine, and not liking the pix I saw in the fabulous Karen McNeil's The Wine Bible of seriously skanky grapes looking like the worst of days in the back of the fridge, I was seriously resolved to avoid anything that sounded like "Sauterne" despite the lyrical praised heaped on the process by my new hero, Karen McNeil. But of course, the very next day while at a wine tasting at K&L Liquors in San Francisco, there it was! The knowledgeable lady who was pouring was promoting "Yap. Yap. Yap. Botrytis..." Additionally it was packaged in the most irresistible gold leafed, laser cut, Parisian-looking-Metro- font-embossed crystal bottle...well, you know me and pretty labels... (like a moth to cashmere people! )Trying not to think of the moldy, rotten grapes, I swallowed. Gulp. The heavens opened, the angels sang, etc., etc. That Dolce had me at hello. Its honeyed sweetness swished to the very doorstep of cloying, then batted its eyelashes..."Hello..." Add that to its silky texture, honey color and fabulous bottle. You have to try it! Can you say, "Expletive Deleted?" One reason I can think to say this is that the wine is so #$%^% good! The sense of fun that owners Jeff and Mary Stai bring to their winery is rivalled only by the way they back it up with quality and hospitality! 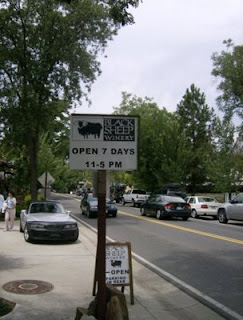 Even before you reach the winery, there is an up swell of playfulness as you read the cool signs. 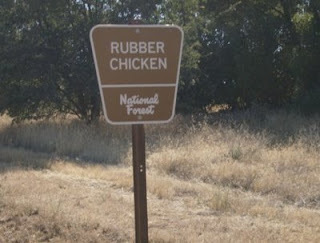 I had heard about the rubber chickens, but laughed out loud at the scale! Too hysterically funny! We were lucky enough to be invited by a friend who is a wine club member. This event made me re-think (and cancel!) some of the other wine clubs I'm in as these guys know who how put on a party and put up some wine! We were lucky enough to try a plethora of library wines and treated to the most amazing pit barbecue that included brisket, turkey , chicken and goat! as well as tasty sides and yummy desserts. This was literally heaven. Decorated in a casual elegant fun way, the table were beautiful! Since we got there a little early there was time to sneak in a few samples as well as get in a little shopping. Feast your eyes on Jeff E-Coli! He squeaks! So did I when I got my little mitts on the awesome wine. Starting with the whites, one of my favorites that I rarely see, Marsanne. Delicious! I wish I hadn't lost my notes! I started at one end of the display and worked my way all the way down. 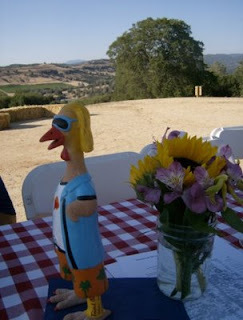 While I really liked the Tempranillo, I totally loved the Syrah and Petite Sirahs! Yes, you can see, we all got TWISTED! Eventually, we had enough of too much of everything. After a bunch of coffee and a double check that I could touch my nose, toes, do the Hokey Pokey on one foot, then the other, I picked up my car keys and went back to the blasting of the swamp cooler at our motel, happy to have unlocked the mystery of Murphys. Picturesque, smart and elegant with a small town feel and big city accouterments. 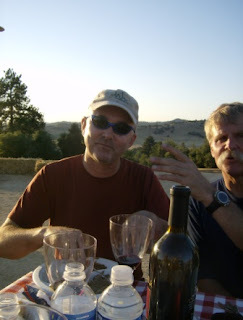 We tasted a lot of good wine in fun environs and came away with a sense of what the rocky soil and full blasting sun (as well as the proximity to Amador County) can produce. Tasty Zins, Fabulous Syrahs, Interesting whites and an AVA close enough to come back to again and again. From the summer glow of the Twisted Oak, I'm already wishing for a snow day! July 4th we arose early (for us), jumped into our red, white and Blue (I wait all year to don my Beverley Feldman satin flag loafers) and set out to find out what Sierra Foothills wine is all about. 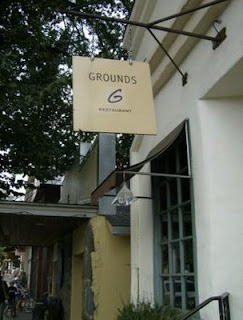 Our only misstep of the day was to return to a spot we'd earmarked for breakfast the night before: Grounds. Although the place is darling and the food is great, the service would have to take a couple of classes and then really strive to achieve "Lackluster" . It took us over an hour to get our food and go, while all around us people were getting served and leaving. In retrospect I'd wished we'd decided to eat across the parking lot from the motel. Because it took so long, we ended up skipping both Lavender Ridge and Stevenot's tasting rooms. The upside, is that Murphys itself has such charm, we resolved to return. One tip: wherever you breakfast or lunch, be sure to use the restrooms as one quirk of Murphys is that due to some litigation by the handicapped, none (really! not even one!) 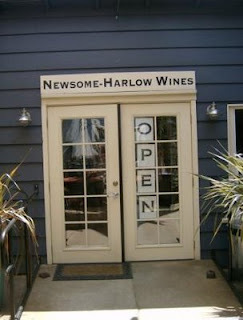 of the tasting rooms have public restrooms. I will say that because of that, to me, the restroom was the highlight of my visit to Grounds. '04 Clockspring Zinfandel - this wine won too many awards to type. Lots of brown spice and black pepper this is tasty! '05 Late Harvest Zinfandel - Sweet and peppery at once! Next stop on our "Park once, taste Lots!" Wine Wobble was Black sheep Winery. 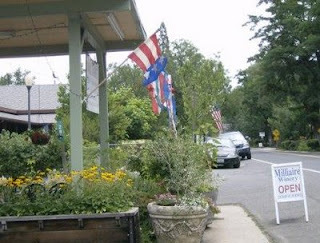 Located on Main Street in a charming former farmhouse. They split their wines into two groups, Black Sheep and also, an everyday wine label, "True Frog", which celebrates the heritage of Calaveras County's historic Jumping Frog. In red, white and rose, True Frog is priced to be a delicious everyday wine. All were vivid colors, with colorful labels and fun flavors. All were good; balanced but powerful tannins that made them seem food friendly. Because I love the unusual and spicy, I ended up buying a Cinsault as well as a Lily Pad White to have on hand for the white wine drinkers in my life. Bottom line: I LOVED the label! This tasting was as super fun experience made even more enjoyable by the nice and knowledgeable tasting room staff. 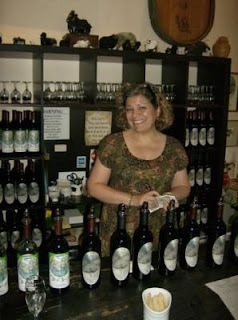 We continued our travels at Salomon Wine Company where the standout for me, because it was so very different was the Muse Winery "Carnivale". Ultra sweet, this is a sangria wine cooler in a bottle. I can totally see serving this on a hot summer night over lots of ice in frosty Mexican goblets. '05 Train Wreck a blend of Cab Sauv with Syrah and a few others thrown in for good measure. Smooth elegant mouthfeel with a delicious dark color. assertive berry flavor and a super finish. Yum! '05 Meritage it had 65% cab Sauv 24% Merlot 11% Petit Verdot and a dark fruit forward taste. '06 El Portal Petite Sirah with 15% Zin this wine had a hint of brown spice and a lot of fruit with out a lot of sweetness. It was a food friendly wine almost chewy with tannins. Look how gorgeous this place is! 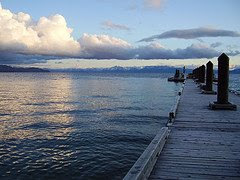 I expect to see you there later this summer or maybe in the winter when the snow hits Murphys! We also hit Zucca, where my tasting was super edited since I knew I had to sober up for the short trek the Indian Rock. More on Zucca from Xandria. Much later after extensive shopping, sightseeing and hanging out in Murphys downtown, we relinquished our parking spot and drove over to Indian Rock. '05 Cabernet Less presence of oak than the preceding wines, it had a soft round taste with sharp tannins at the beginning softening to a round finish. The tasting room staff made this a fun and informative visit! Whew! It was back to the motel for a short nap to rest up for the main event: The Fourth of July Barbecue at Twisted Oak! So, Fourth of July. 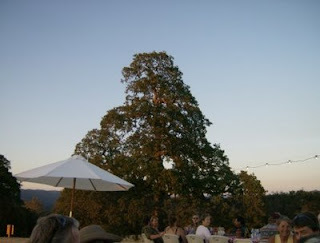 Murphys is my favorite spot in the Sierra Foothills. 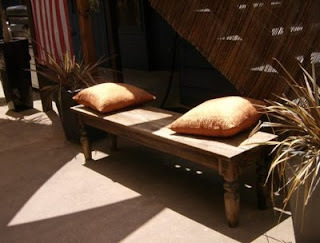 Very Americana with a nice dash of Northern California charm. Only two hours away from San Francisco, but it feels a world away. We left the East Bay on our girls-gone-wine road trip, blasting ABBA, getting lost and fortifying ourselves with Sonic. Carhops? Who knew! We slid into Murphys just in time for our spa appointments . The La Stone massage at Jillian's Day Spa in Murphys is a great way to make the break from your day to day and get into vacation mode quickly. Park once, then explore. We wandered into a restaurant called "The Wild Grape" on grill-it-yourself rib eye night. Tempting, but what we really wanted was wine. 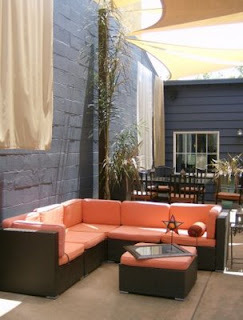 The Wild Grape is built into a former residence and while it has a great modern California style, it also has the best backyard with tables, umbrellas, fairy lights tucked into the manicured foliage and a kicked back vibe. This place stocks an edited selection of local wines. At the suggestion of our server, Paul, we started right at the top with an '04 Old Vine Zin from Milliare. Yum! Dark and rich, redolent with red and black raspberry, I was in heaven! We were treated to a second glass by Dave who was sweet enough to bring us into his birthday celebration. I picked the Millaire Grenache for a change of pace. Syrupy sweet, it would have been great with dessert, which we skipped. After we reciprocated by buying Dave a birthday dessert, we cruised off to see the town. Murphys isn't large but it's stylish and fun. We ended up forgetting that if we waited too long to find dinner, our options might be limited. 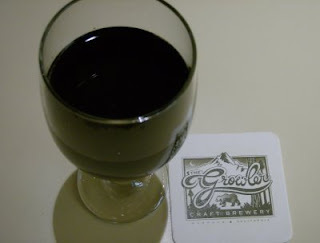 True to form, we were bounced out of several restaurants until the great team at Figaro's, which also houses the Growler brewery took pity on us and opened up the kitchen for a cold sandwich. Double yum! Russell the Muscle hooked us up with an Italian sub that was buonissima! And best of all, while we waited, Jim busted out some Milliare Merlot, which was a super surprise. That wine was also very dark and lush with all you would expect from a Merlot and the ability to stand up to the rich meat in the sandwich. After ward, Jim treated us to a personal tour of his photos from his previous career managing events at the Mountain Winery. Iggy! Traveling Wilburys! My absolute fave ---and Jim's---Chrissie Hynde! Everyone! What an awesome Day 1! We tucked ourselves into our motel room while visions of wine to come danced in our heads!